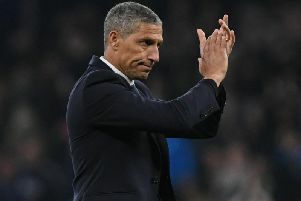 Brighton have submitted an application for Tier One status for the 2018/19 season, after the FA revealed plans to restructure the highest two tiers of the women’s football pyramid in September. Albion submitted the application due to a desire to play at the highest-possible level, and the club says it reinforces their fully integrated approach to women’s and girls’ football at the club. As part of the application, the club is also committed to meeting the FA’s key criteria of full-time professional players receiving a minimum of 16 hours of contact time per week, and ensuring they receive the necessary support required at the American Express Elite Football Performance Centre. Albion chief executive Paul Barber said: “We feel it’s important to have equal status for women’s and girls’ football at this club as far as we possibly can. “We will be putting in a substantial extra investment to support our application, which is something we’ve spoken about at board level, and we’re more than willing to make that commitment. Women’s first-team manager Hope Powell said: “This is the right thing to do, and the club is now in the position to cater for full-time athletes within the women’s game. “As manager of this club, my ambition is to help it and these players grow, so we can compete at the very highest level. Albion currently play in Women's Super League 2 and are fourth in the league table after five matches. Women's chair and club director Michelle Walder, added: “Our vision for football is as an inclusive, ambitious, and safe sport for everyone. “This exciting Tier One application clearly shows our commitment to women’s and girls’ football both on and off the pitch." The FA plan to confirm the clubs who have been successful with their applications for Tier One status in mid-December. The club thank all the key stakeholders for their continuous support of the application, which include: their sponsors, Albion in the Community, the Sussex County FA, Worthing College and both the University of Brighton and University of Chichester.